Turkish Philanthropy Funds, DLD’yi ve kurucusu Sema Başol’un katkılarını anlattı. ANASAYFA > BASINDA DLD > Turkish Philanthropy Funds, DLD’yi ve kurucusu Sema Başol’un katkılarını anlattı. When Sema Başol, an executive with more than 30 years of experience, moved from Los Angeles to Silicon Valley, she didn’t expect to get closer to Turkey. Yet, that is exactly what happened. “Here is a part of the country, that is highly creative and all about empowering individuals. What was I going to do? I care a lot about Turkey and I have a strong bond to Turkey,” explains Ms. Başol with enthusiasm. There is no doubt she says that she was inspired by the women of Silicon Valley. “They were helping women in other parts of the world. They took a stand. They didn’t just talk about it.” According to Ms. Başol, inspiration models can do wonders in winning new leaders. When combined and offered with a set of acquired skills, mentors can inspire and help women to realize their full potential. That is how and why Ms. Başol came to found Değişim Liderleri Derneği (Change Leaders Association), an organization that helps women with self-confidence by offering workshops on life and leadership skills. Every year, a small group of college students are selected to take on a social change project. “Projects are just the tools” say Ms. Başol. “Young women who attend the programs learn to take on responsibility, to run meetings, to delegate, to speak in public… how to work as a team and how to manage a team.” At the end of the year, all the participants gather and complete an extensive program evaluation form. Most of the participants continue as volunteers and some become facilitators. What is the key to becoming a philanthropist? To start with an idea and make it happen can be overwhelming admits Ms. Başol. But the conviction to make a difference overrides any fear. “Enrolling others in a vision, to get them as excited as you are is a key to success” says Ms. Başol who has joined forces with TPF to make her vision become a reality. Sema Başol supports Change Leaders Association (Değişim Liderleri Derneği) in Turkey. 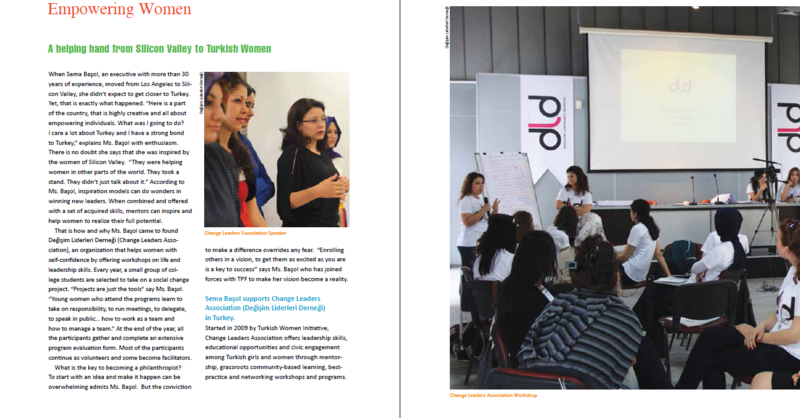 Started in 2009 by Turkish Women Initiative, Change Leaders Association offers leadership skills, educational opportunities and civic engagement among Turkish girls and women through mentorship, grassroots community-based learning, bestpractice and networking workshops and programs.